Space shuttle Atlantis with it crew of six astronauts lifts off from Launch Pad 39A at NASA's Kennedy Space Center in Florida on Nov. 16, 2009. WASHINGTON — The space shuttle Atlantis roared into spaceMonday afternoon to begin a vital 11-day delivery run to the InternationalSpace Station. 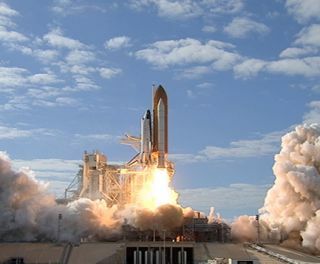 The shuttle blasted off at 2:28 p.m. EST (1928 GMT) fromLaunch Pad 39A at NASA's Kennedy Space Center in Cape Canaveral, Fla. Theliftoff was the second-to-lastplanned flight for the 24-year-old orbiter — Atlantis is slated to be retiredwith its two sister shuttles in about a year. "All the vehicle systems are outstanding today, the weatheris near perfect," said launch director Mike Leinbach just before launch. "Wewish you good luck, Godspeed, and we'll see you just after Thanksgiving,"he said to the crew. "We really appreciate all the effort that’s gone into makingthis launch attempt possible," responded commander Charlie Hobaugh. "We're excited to take this incredible vehicle for a ride and meet up withanother incredible vehicle, the International Space Station." Hobaugh is leading the six-membercrew on the STS-129 resupply mission to ferry about 27,250 pounds (12,360kg) worth of spare parts to the station. "Our flight is one of the first flights that externallywill provide a lot of the spare parts and the long lead type of replacementitems that are required to keep [the station] healthy and running for quitesome time," Hobaugh said in a preflight news conference. Among the large parts packed onto the shuttle are sparehigh-pressure gas tanks, pumps, power units and battery supplies, as well as partsfor the station's robotic arm. The equipment is loaded into two massiveplatforms due to be installed on the station's backbone-like metal truss. Thedelivery should help set up the orbitinglaboratory to continue to run after the space shuttles stop flying. "These are the spares that will allow us to utilize theinvestment that we've put in," said Mike Sarafin, the lead shuttle flightdirector for the mission. Flying with Hobaugh are pilot Barry "Butch"Wilmore and mission specialists Mike Foreman, Bobby Satcher, Randy Bresnik andLeland Melvin. Wilmore, Satcher and Bresnik are rookie spaceflyers. "We don’t use the "R" word at all,"Hobaugh said. "Everybody here is an astronaut. We consider them, eventhough they have not been in the environment yet, seasoned astronauts." A seventh crewmember is slated to join the STS-129 crew forthe ride home: NASA astronautNicole Stott, a space station Expedition 21 flight engineer who's been inspace for about three months, plans to fill the shuttle's remaining seat forthe journey back to Earth. The astronauts expect to spend Thanksgiving in space.Bresnik, in particular, will also miss another major family event. His wifeRebecca is expected to give birth to their second child – a baby girl – whilehe is space, according to ABC News. Foreman, Satcher and Bresnik plan to carry out the mission'sthree planned spacewalks, or extravehicular activities (EVAs). "All of the EVAs that were doing are six or seven hoursand there's a number of complicated tasks in each one of them," Satchersaid. In addition to the spacewalks, the crew plans some complexrobotic work to help attach the new cargo carriers to the station and transferthe spare parts. "All that in 11 days,” Sarafin said. "It’s a lotto package into a finite period of time; it’s a challenging mission." Monday’s launch marked the start of NASA’s 129th shuttlemission since the fleet began flying in 1981, as well as the 31st liftoff forAtlantis. The launch also marked the first time NASA has invitedTwitter followers to attend a liftoff. About 100 fans gathered in CapeCanaveral for a two-day "tweetup" to view the flight and learn moreabout NASA and the shuttle mission. "I can't stop jumping up and down!" said JanDuRaine, who travelled from Valley Springs, Calif. to view the launch. "Iwant to experience the sights, the noise and the vibration from the soundwaves. To me, this is the experience of a lifetime." Attendees said they relished they opportunity even as twoAtlantis astronauts – Satcher and Melvin – plan to tweet about their missionfrom space. Satcher is posting updates as Astro_Bones and ZeroG_MD, withLeland writing under the name Astro_Flow. "The behind-the-scenes aspect intrigues me," saidTina Cassler of Lauderdale, Minnesota. "I hope to learn a great deal andbetter understand all that they do at NASA." SPACE.com is providing complete coverage of Atlantis'STS-129 mission to the International Space Station with Staff Writer ClaraMoskowitz in Washington, D.C. and Managing Editor Tariq Malik in New York. Click here for shuttle missionupdates and a link to NASA TV.